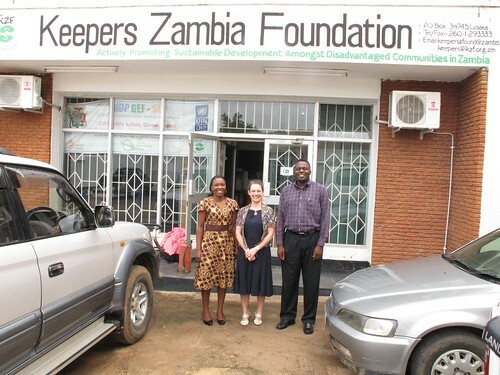 Today started early with an 8am meeting with Ruth and John at Keepers Zambia Foundation (KZF). Regular readers will know that KZF are the SODIS experts in Zambia but their promoters, who work at community level, support other aspects of sustainable livelihoods as well. The purpose of the meeting was to review the outcomes of Friday’s workshop from KZF’s perspectives. As always in these conversations you learn a lot. In Zambia, there has been a bit of tension between those that are perceived to promote SODIS as a route to clean water supply and those that promote the use of Chlorine tablets to sterlise the water. Aquatabs is a brand that was mentioned in the workshop. In the field, KZF promote the use of safe water, hygiene and sanitation (or WASH) and one tool they use is SODIS, so their target is on a clean water supply and not a single method of achieving this. KZF promote the use of chlorine tablets and the boiling of water as alternatives to SODIS in the rainy season. So I think that we should do the same. We want the AidPod to carry WASH components and this may include a SODIS bag but might also include Aquatabs and would definitely include educational materials to do with hygiene, sanitation and clean water. We also talked about micro-finance. KZF were the only stakeholder at the workshop who have experience in this area and they work through the Micro Bankers Trust. We think that we may need to give credit to the retailers as they may not have enough working capital (cash) to be able to afford to buy the initial AidPod Mother’s Kits. This is something we need to verify through fieldwork. We spent the rest of the day working on a new structure for the pilot. This was the ‘Aunt Sally’ we started the workshop with on Friday. View more presentations from ColaLife. This is a 2-stage structure: a set-up phase followed by a pilot phase. However, the consensus from the workshop was that we should have a 3-stage structure: a set-up phase of two parts followed by a pilot phase. This is how far we got rearranging things (see below). Click on the image to see it full size on Flickr. The first, pre pilot, phase has two parts. The first is a set-up phase which would establish the baseline and create the resources we need for the pilot. The second part is a mini-pilot which would test all the systems before moving into the pilot. For this we might choose to work with one wholesaler and the retailers he/she serves. 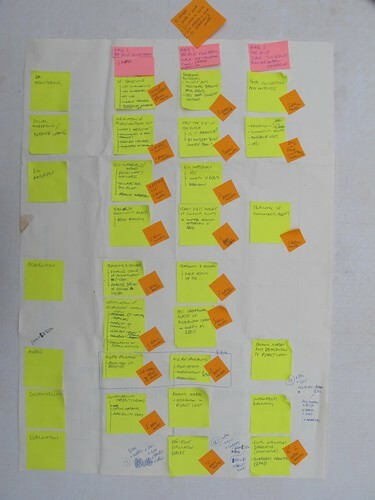 Tomorrow we are off to UNICEF again to work on a logical framework for the project.